In order for decorative wicker interior elements to serve long time and have nice appearance rattan furniture needs a proper care. Actually, care for such type of furniture implies carrying out a range of preventive measures and prevention of cracking. Rattan furniture is resistant to moisture, so it does not require treatment with various water-repellent agents or polishes. In the manufacture rattan furniture is coated with a special water-based varnish which creates moisture repellent properties. - Such furniture should be used in a dry place where there is a good ventilation and heating during the winter period. The most optimal temperature is from 40 degrees to 100 degrees, and humidity – 65-90%. - To avoid dulling and deformation of the furniture top coat, wicker furniture should not be placed next to radiators, and it should be protected from direct sunlight. - Such liquids as gasoline, alcohol, acetone and other solvents of lacquer coatings will damage the furniture. Therefore, you should avoid the contact of these liquids with furniture surface. - To remove dust from the rattan furniture is better with a soft bristle brush or vacuum cleaner. If the surface of the interior items becomes dirty, then you can wipe it with a soft sponge soaked in a solution of soap and water or a special detergent designed for delicate fabrics. - You should also protect such furniture from the hot, for example, do not put on the table surface hot kitchen items, or cups with hot tea on the armrests. The coating of rattan is absolutely not intended for such purposes. - When caring for rattan interior articles, do not use stiff, especially metallic brushes and graters, since its coating doesn’t like such mechanical impacts. 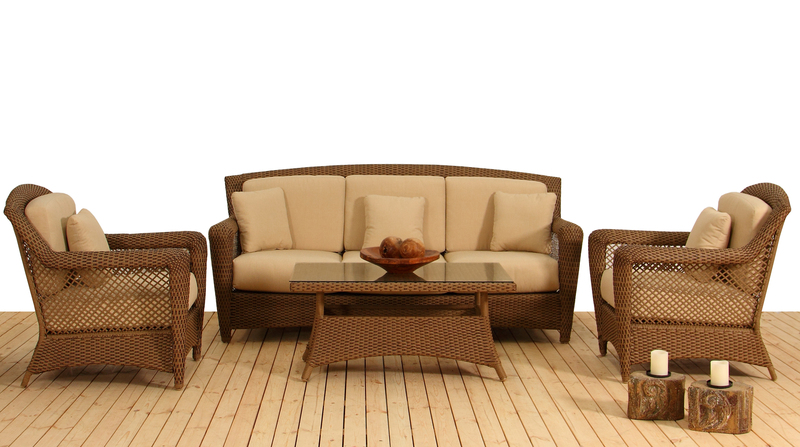 - It is also not recommended to use abrasive cleaning agents for cleaning the surface of the wicker furniture, as they may affect the appearance of micro-scratches on the surface. It is better to use some mild detergents diluted in warm water. · To clean the upholstery fabric of rattan furniture from stains of tea or coffee you need to moisten a soft sponge or a cloth in a soap solution and wipe the contaminated places, then wipe already with a clean damp sponge. It is also possible to use for cleaning of such stains on the upholstery a special foaming agent, designed for cleaning carpets. · If you have smeared the surface of furniture with upholstery with lipstick, fruit juice, a ball pen or with wine, then you can use a 10% solution of ethyl alcohol. Dampen a sponge in alcohol and wipe the stains with it, then wipe with a cloth dampened in clear water. · Beer stains are easily removed with the help of vinegar and water. 2 tablespoons of vinegar combine with 1 liter of water and use this solution to wipe the stains. · The wax from the candles can be removed with a knife and a vacuum cleaner. To do this, gently scrape off the wax from the surface of upholstery material and collect it with a vacuum cleaner. Then cover the wax stain with a thin paper and iron with warm iron. After that, apply a stain remover on the cloth and dry the liquid on the surface. · If the chewing gum stuck to the upholstered material, then ice and methyl alcohol will help us to deal with this. Lay the ice cubes over the gum, and when it freezes scrape it. Now apply methyl alcohol with a sponge and dry the material. · At least once a year, but it is better, of course, once in six months, it is recommended to wash the rattan furniture with warm soapy water. And remember, until the furniture is completely dry it is forbidden to sit on it. Drying of such furniture must be in natural way, indoors or outside but not in the sun. · To return to such furniture its original gloss, you may apply a thin layer of oil varnish, and then a layer of colorless lacquer. As you can see, maintenance of rattan furniture is not problematic; you just need to remember that this furniture needs your care. Therefore, carrying out the necessary procedures, you will be able to preserve its original appearance for many years. After all, furniture made of natural, eco materials have always been popular and appreciated. Leather is the most expensive, but at the same time the most beautiful and practical material for furniture upholstery. Its usability is in the fact that such upholstery may serve for a long time, maintaining its glamour, however under a condition that proper leather furniture cleaning will be performed. And the best thing is to entrust this procedure to professionals. Leather is a natural material, but porous, and hence it is hygroscopic. This means that any spilled liquid will be very quickly absorbed by upholstery. And if it’s a drink or wine, you should hurry up with its removal, otherwise the stains are inevitable. The protective coating, applied at the furniture factories, eventually deteriorates and upholstery becomes less protected. But what to do, if the stains appeared after all? First of all you shouldn’t try to remove them by yourself. Most likely you will just reinforce it by using the on-hand household detergents. The best thing is to call to the cleaning company. And as quickly as possible. 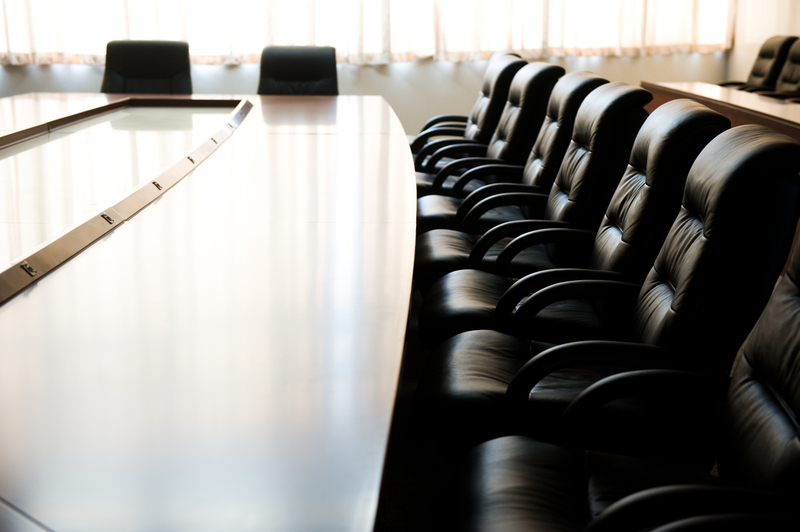 However, leather furniture cleaning belongs to the high complexity services category, that’s why it requires from the specialists high qualification, professional experience and availability of special cleaning agents. Therefore, the price of the service shouldn’t be a major factor in your choice. Inexpensive so-called “professionals” offer treating the leather with wax containing compositions. But this is strictly forbidden. There are several reasons for this. First of all, wax is very hard to be removed from leather afterwards. Secondly, this material bridge the pores, the upholstery starts to age rapidly due to lack of gas exchange. Third, leather furniture is getting dirty much quicker, as wax absorbs dirt actively. And finally, the typical for polished natural leather gloss disappears. Thus, if you want your leather furniture to serve you faithfully for a long time, don’t tempt fate, entrust the care about it to real professionals. Specific furniture is an integral element of office spaces, which is equally important for the normal working process as the office appliances. That’s why office cleaning must definitely include office furniture care. For the furniture to serve longer, optimum “life conditions” should be provided for it in the first place. - the weight of the load should also be taken into consideration. In accordance with recommendations, maximum load on the bottom of the drawers should not exceed 10 kilos, and the load for the racking shelves is allowed twice as much as for the drawers. Furniture is divided into different categories, so during the office cleaning it is important to consider the material it is made of. 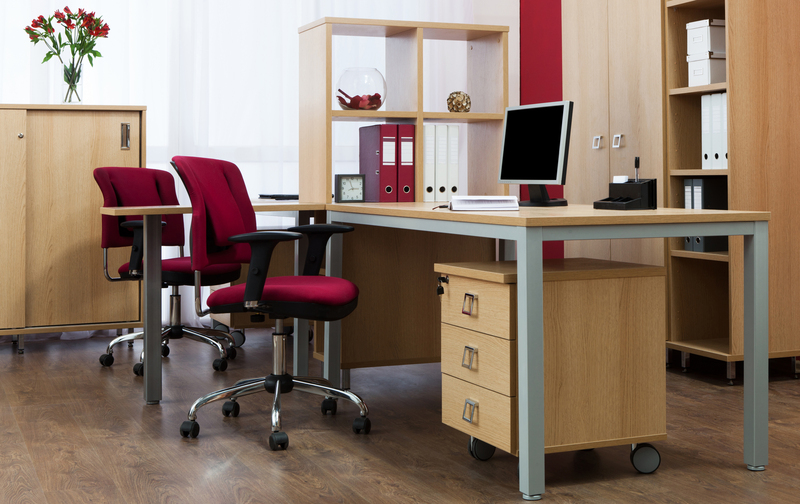 Laminated office furniture sets are considered the most undemanding in care. Laminate is moisture resistant, sustains well different mechanical loads, but doesn’t stand abrasive effect. It’s enough for laminate to be wiped with a wet cloth, but as for the lacquered furniture, it requires much closer attention. During cleaning the surface of such furniture is wiped with a special wax containing mixture. It gives gloss, restores micro defects and performs a protective function at the same time. The most difficult in maintenance and cleaning is upholstered office furniture. But this is the topic for our next article.